In order to complete the steps outlined on this page, you need a multimeter with a dwell and/or duty cycle function. Click here for examples of what to look for. Complete details are in the master PDF guide. Note: All duty cycle information, adjusting and testing procedures are now in one complete document. Please click here to open/download the complete guide in PDF format. Before testing, let's understand the frequency valve's function. On CIS-lambda, the frequency valve works in conjunction with the oxygen sensor and K-Jetronic control unit in an effort to produce K-Jetronic's ideal 14.7:1 air-fuel mixture ratio for maximum fuel economy and emissions control. The oxygen (lambda) sensor sends electrical signals to the control unit based on the oxygen content in the exhaust. Also adding to the electrical signals that the control unit receives are the lambda thermoswitch and full-throttle switch, if equipped. The control unit, in turn, sends voltage signals to the frequency valve. Those electrical signals are on-off pulses; hence, the valve is either open or its closed at any given second. The frequency of these on-off pulses (the buzzing you hear and vibrating you feel) is the valve's duty cycle, which controls the fuel distributor's internal diaphragm's lower chamber pressure. A higher duty cycle results in reduced lower chamber pressure, thus returning more fuel to the fuel tank and sending more fuel to the injectors (i.e. the higher the duty cycle, the more the valve is open, the richer the mixture). A lower duty cycle results in increased lower chamber pressure, thus returning less fuel to the fuel tank and sending less fuel to the injectors (i.e. the lower the duty cycle, the more the valve is closed, the leaner the mixture). The frequency valve's duty cycle is measured on a 0 to 100% scale. If the duty cycle is at 50%, this means the frequency valve is open 50% of the time, and closed 50% of the time. Conveniently, the duty cycle can be measured with a dwell meter set to the 4-cylinder scale; the example 50% duty cycle corresponds to 45° dwell (100% being 90°). Disconnect the frequency valve's harness connector. Measure resistance across the valve's terminals. Resistance should be 2 to 3 ohms. Yes: Valve is fine, continue testing. No: Valve is faulty and should be replaced. Remove the fuel pump relay and jump terminal positions 30 and 87. Using your test light, probe the frequency valve's harness connector terminals. Your light should shine. 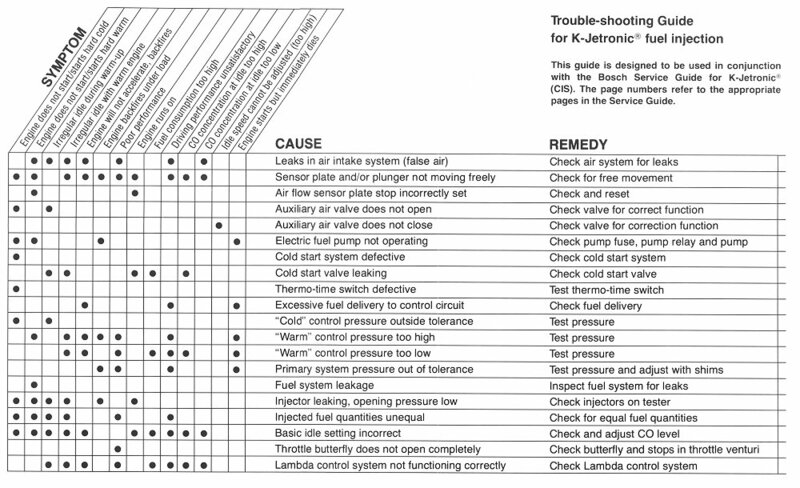 No: Check the fuel pump fuse, fuel injection power supply relay (there should be power going to the Jetronic control unit; see pin-outs below), wiring between all of these components, and all associated ground connections. "All of your VWs have marks on the rotating parts to denote 0° TDC. The cam has a dot that lines up with the valve cover. The flywheel has a notch that lines up with the center of the hole on top of the bell housing. The distributor has a slash that lines up with the rotor. Line all of these up and your car is at 0. No advance. No retard. In a pinch, I've put the car in 5th gear (with the car off!) loosened the distributor and pulled the car forward until the advance mark on the flywheel appeared in the little timing hole. I then turned the distributor until the hash mark lined up with the rotor and tightened her down. If your flywheel notch is at 3° or 5° or whatever, now your distributor is at 3° or 5°. It's probably good for keeps or at least until you can get your hands on a timing light, but it DOES work accurately!" It’s very possible that your air/fuel mixture adjustment hole still has its anti-tamper plug installed. If so, it will need to be removed, or tampered with, in order to adjust the air/fuel mixture as described in the measuring and adjustment section. “The easiest way to [remove the anti-tamper plug] is to flip the complete sensor plate assembly over and punch the plug out with a long thin punch. The other tamper method requires drilling a centered hole in the plug, screwing in a sheet metal screw and pulling the screw up. You've got to be sure in advance that the drill bit used is small enough that the sheet metal screw you choose will have plenty to grip. Also, grind the point off the tip of the sheet metal screw so it doesn't bottom out. Oh, yeah; you can't drill all the way through the aluminum plug [because] there's a floating steel disc in the bottom of the plug that will just spin when the drill bit hits it. The steel disc is to prevent drill chips from dropping inside. The steel disc is also what a pointed sheet metal screw will bottom out on before the rest of the screw gets a good grip. This page is dedicated to checking and, if need be, adjusting your CIS-Lambda fuel injection system. "Do not try to correct engine trouble by making simple adjustments to the idle speed or the idle mixture (CO). Changing these settings without the proper measuring equipment will only be a hindrance when trying to locate the real fault."